Welcome to P&K Tubular Products, the leader in the aluminum pole industry -- supplying the commercial, industrial, highway, traffic, decorative municipal and utility markets, as well as a wide variety of brackets. For over 100 years, we have been the innovator of standards, offering the most extensive warranty in the industry. Navigate through our site to find out why we're your best choice when designing your installation for aluminum pole products. 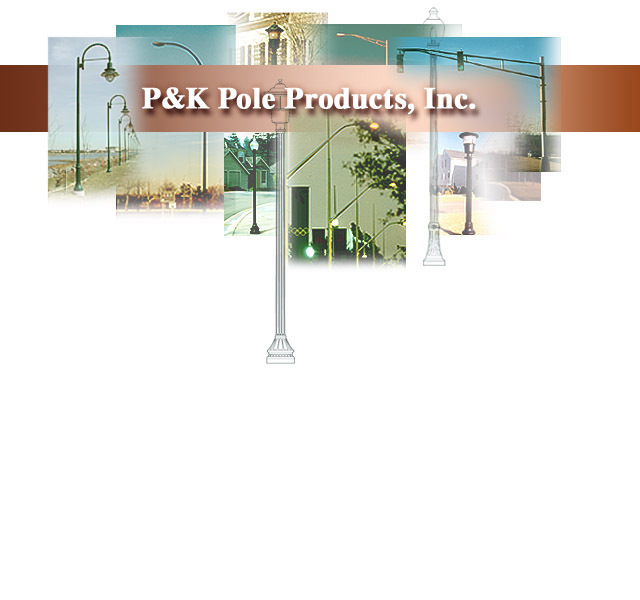 P&K teamed with Flagpoles Incorporated now has unmatched capability in the manufacture of lighting standards, traffic equipment and tapered shafts. No other Pole Manufacturing facility in the world has a more versatile, larger and high Tech capability. Whether producing a custom designed ornamental project or supplying exact replacements for a 50 year old installation, P&K has the expertise and capabilities the customer deserves. You may have tried the rest- now come back to the best P&K Tubular.